Dromoland Castle Hotel in Clare, one of the finest Irish five star hotels. 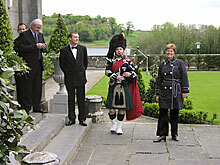 Dromoland Castle is ideally located 8 miles from Shannon Airport in Clare just outside Newmarket on Fergus. The proximity of this beautiful castle hotel in Clare Ireland to other major cities in the South /South West of Ireland make it an ideal location for touring: 19 miles from Limerick city, 48 miles from Galway city, 80 miles from Cork city and 88 miles from Killarney. Dromoland Castle, one of the most famous baronial castles in Ireland, was the ancestral home of the O'Briens, Barons of Inchiquin, who are one of the few native Gaelic families of royal blood and direct descendants of Brian Boroimhe (Boru) High King of Ireland in the eleventh century. John Hehir, Director of Sales was on the August 2, 2009 "Travel with Stephanie Abrams!" Radio Show in hour 1.